Five-year-olds are often quite good with scissors. They have been developing their cutting skills for a few years and are now able to cut circles and squares. The end results may not always be perfect, but they are constantly learning. 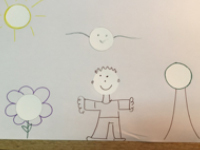 Here are four simple crafts that will help them work on different fine motor skills. For each of the following activities, I suggest tracing several different circles ahead of time and cutting a square around each one, leaving a border around them (see picture). This will make cutting the circles easier for children. Depending on the number of circles that need to be cut, you may also choose to cut a few for your group to simplify the task, depending on their cutting abilities. Glue them on the piece of construction paper. Keep one circle for your caterpillar's head. The other circles will all be used for the caterpillar's body (see picture). 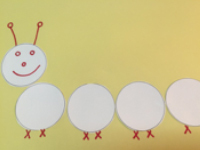 Draw circles for caterpillar eyes and X's for caterpillar legs. If you wish, give children four buttons and have them hide them in their hands. Show them how they can slide them out one at a time, using their thumb and index finger. 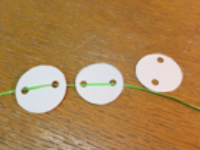 They can glue one button inside each circle to create personalized caterpillars. Give children several circles to cut out. They can cut out as many circles as they wish. Use the hole-punch to punch two holes out of each circle. Give each child a piece of yarn or string and encourage them to thread it through several circles. If you have different colors of circles, invite children to alternate colors to create a pattern. You can use the circles to form a garland, a necklace, or a colourful banner for Halloween or Christmas. Note: If you have Christmas or Halloween-themed paper, use it to create a garland to add to your daycare décor. Trace a square on a piece of construction paper for each child. Leave a wide border around each square to make cutting it out easy. Have children cut out their square. It will become their basket. Trace several circles (different sizes) on construction paper. Choose specific colors depending on the theme of your activity (blue for snowballs, red for apples, pink for flowers, etc.). Have children cut out several circles. 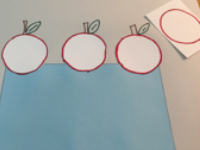 Have them glue the circles above their square on the 8.5 x 11 piece of paper to represent a basket of apples, pumpkins, snowballs, etc. Trace circles of different sizes on construction paper. Leave a border around each circle to make cutting them out easier for little hands. 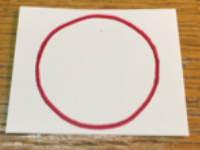 Invite each child to cut out several circles. Glue the circles on the 8.5 x 11 piece of cardboard. Have fun cutting and creating with your group!